Now HDFC Bank Bans Cryptocurrency Trading For Customer Safety! The bank is putting the ban in place in view of RBI's cautionary note to the public. Cryptocurrency is a very contentious topic in India right now. With conflicting news flying about, there’s no real clarity on the issue. But the Indian government seems to be firm on its stance of not legalising cryptocurrency in the country. From terming cryptocurrency as a Ponzi Scheme to sending notices to Bitcoin investors, the government is doing everything in its power to deter cryptocurrency trading in India. As a direct effect of this stance, Citibank became the first bank in India to ban the purchase of cryptocurrency using their debit or credit cards. Globally, Bank of America and JP Morgan Chase are two of the banks that have a similar ban in place. Now HDFC Bank has joined the ranks with its own ban on cryptocurrency trading. But why are banks putting such a ban in place? 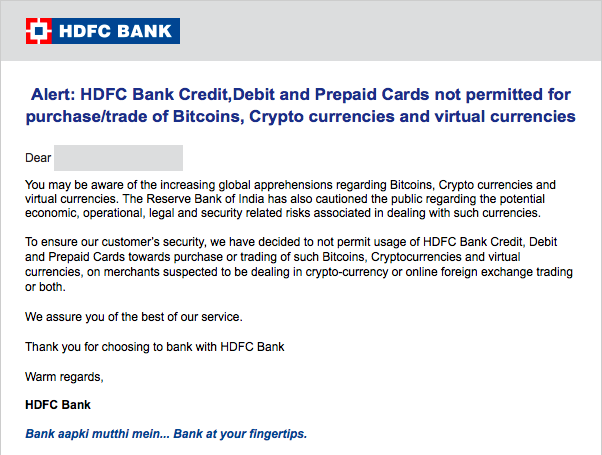 HDFC bank has been sending out emails to all its customers informing them that they won’t be able to purchase or deal in cryptocurrency exchange using HDFC Bank’s debit, credit and prepaid cards. The mail effectively states that the bank is putting the ban in place in view of RBI’s cautionary note to the public regarding “the potential economic, operational, legal and security-related risks associated in dealing with such currencies”. The problem with cryptocurrency, at least in India, is the government’s stance. Earlier this year, the finance minister declared Bitcoins as illegal. But less than a month down the line there was news that the government was planning to regulate cryptocurrencies. While this is sending out mixed signals, the government and the RBI are firm on their stance on cryptocurrency. So far the value of cryptocurrency has been a wild rollercoaster. While it touched a record-high of nearly $20,000, its current value is hovering around $10,000. This extreme rise and fall have led many experts to term cryptocurrency as a bubble which could explode anytime. Though the technology behind cryptocurrencies, the blockchain, is sound and is being adopted by many banks and financial institutions around the world, the wildly-fluctuating value has put-off many governments from cryptocurrency. As of now, in India, cryptocurrency trading is considered illegal. But many enthusiasts and cryptocurrency exchanges remain hopeful and are waiting for the day cryptocurrency achieves a legal status in India. What are your thoughts on cryptocurrency trading? Do let us know in the comments below.